Would you sell your sweet ride for a few hundred dollars? Unless you've got a clunker parked in the driveway, that amount may be far less money than your vehicle is worth. 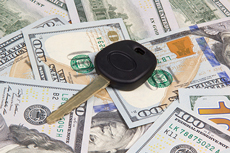 Yet, according to a new report published by the Consumer Financial Protection Bureau (CFPB), one in five borrowers of single-payment car-title loans have their vehicles seized when they fall behind on repayment of their loans. By signing over title to the vehicle to a title loan company, borrowers relinquish their ownership for a few hundred dollars. In other words, many who take out an auto-title loan get taken for a very expensive ride! Auto-title loans are small-dollar, high-cost loans offered by non-depository lenders (organizations other than banks or credit unions). The typical borrower has a pressing need for immediate cash, and interest rates on these loans can be very high. Like payday loans, car-title loans are not issued based upon the borrower's ability to repay—so credit checks typically are not performed. Instead, loans are issued based on the value of the collateral (your car, truck or motorcycle). As the name implies, when you sign up for one of these loans, you must surrender title to your vehicle as collateral. If you fail to repay the loan on time, you can lose ownership of your vehicle. Of the 3.5 million vehicle title loans analyzed by the CPPB, the average loan amount was $959 and carried an annual percentage rate of around 300 percent. Over half of loan sequences are for more than three loans, and more than a third of loan sequences are for seven or more loans. These loan sequences have the potential to destroy a borrower's credit, given that borrowers who take on increasing amounts of debt over time are at greater risk of default. According to the report, only a small number of loans (one-in-eight) were repaid in one payment cycle. The CFPB report further found that vehicle title loans have high default rates, with about a third of loan sequences experiencing default and one-in-five resulting in the repossession of the borrower's vehicle. The report reveals that single-payment auto-title lenders appear to derive a substantial amount of revenue from people who take out multiple loans in a lengthy loan sequence. Fewer than one-in-five borrowers repay their loans in a single payment without having to reborrow. That means most people wind up paying high fees and ever-compounding interest. The loan may eventually be repaid, but at a far greater cost than when the original loan was taken out. If it's not repaid, the borrower defaults, with the vast majority of defaults resulting in the surrender or seizure of the vehicle to satisfy the title loan. Without the vehicle, a borrower may find they are unable to get to work, transport children to school or travel to receive medical treatment. Signing over the title of a vehicle to an auto-title lender places the vehicle's owner in significant financial jeopardy. Before you risk getting taken for a ride with a costly loan, be sure to explore lower-cost options. Those might include a loan from a bank or credit union, if you qualify, or financial assistance from family or a community organization.